WOOSTER, Ohio — The 2018 version of the Wayne County Fair took a community effort — not only from locals but also from a community two counties to the west. With the threat of flooding in the forecast, and with limited time to act, fair officials made the difficult decision to evacuate several of the livestock species on opening day, which included moving nearly 400 hogs to the Richland County Fairgrounds, in Mansfield. On Saturday, Sept. 8, Wayne County Fair board members and emergency management personnel realized they had to act. Their latest review of the forecast from the National Weather Service showed as much as 4-6 additional inches of rain could fall through the weekend, and because part of the fair lies in the floodplain, they decided to be proactive. 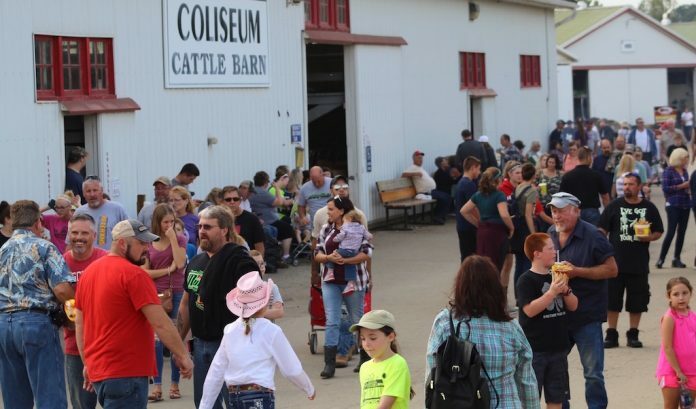 Mike Kinney, Wayne County Fair board president, said his staff began discussing alternate plans the day before the fair, which included the possibility of moving the livestock. Multiple counties made offers, including Ashland County, but because their own fair is going on this week, through Sept. 22, it made sense to look elsewhere. 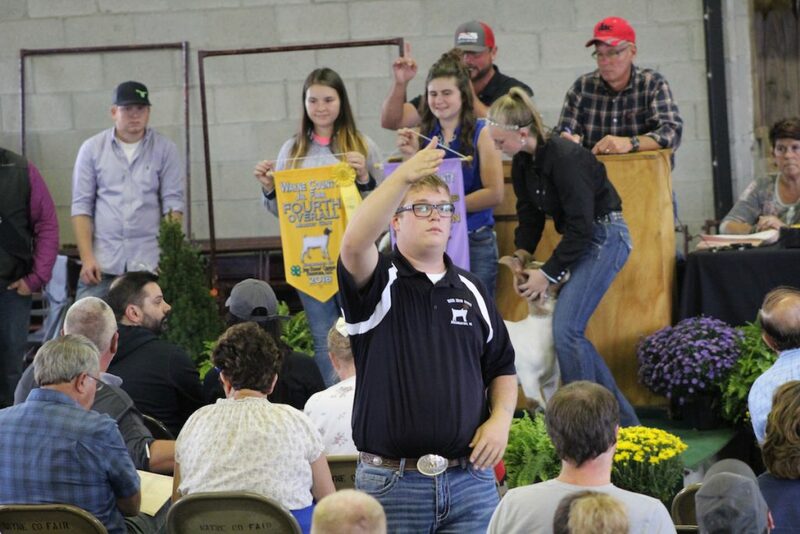 Fortunately, the fair board had some connections with Richland County, and Richland County Fair Board President Jason Snyder happened to be on the Wayne County grounds on opening day, watching the goat show, so he was able to make some calls and help put a plan in place. The auction staff calling in the bids during the goat sale. With the help of the Richland County Fair board, and Richland County’s OSU Extension, more than 100 people were on hand in a couple of hours, to help get the barns at the Richland County Fair ready to hold swine. Volunteers worked to put the pens up, and the hogs were moved in, with fresh wood shavings, all in about three hours. Most of the steer shows were held as usual, but by the end of the day, the steers were shipped to the Creston Livestock Auction barn, where they were held until the end of the fair. Dairy and horse projects were also evacuated, although most were offered the chance to return to the grounds early in the fair. Judy Villard Overocker, the Richland County OSU Extension director, said Richland County had to use its hog barn, plus portions of the sheep and goat barns, due to the large number of hogs from Wayne County, and because Wayne County houses just one hog to the pen, instead of two. She said one difference, though, is that hogs were not penned by 4-H club, which meant there was a good chance the exhibitors did not know the exhibitor next to them in the barn. While this may have been a challenge, in some ways, she said it was also an opportunity, because it forced exhibitors out of their comfort zone and to get to know other exhibitors. “They didn’t know who was next to them or across the aisle,” she said, adding that “it was a beautiful thing” watching them talk to each other and make new friends. The shows were held at the same days and times as they would have been in Wayne County — just at an entirely different location. To help accommodate those who could not make the drive to Richland County, the OSU Extension staff worked out a way to livestream the show, so it could be watched from anywhere with Internet access. This helped exhibitors who could not make the 45-minute drive, or who had other fair commitments they needed to keep. Abbey Werstler, last year’s Wayne County Fair Queen, said volunteers worked together “like a family,” both inside and outside of the show barns. Werstler shows goats and is a sophomore at the Agricultural Technical Institute in Wooster. She spoke to a group of county ag leaders during a breakfast meeting Sept. 12. It was the kind of fair week no one hopes to see again, but Snyder said he was glad to know the two counties could pull it off — if they had to. If all goes as planned, Wayne County expects to have a new multipurpose and show building constructed by the start of next year’s fair. On the last day of the fair, board member Ron Grosjean stepped up with a $400,000 donation, helping the fair top its $1.75 million goal. He could not be reached for comment, but in a Facebook video posted by the fair, it was obvious that he supported the building campaign and that he was emotional about offering his support. Likewise, Richland County Fair is working on its own building campaign, with plans to construct a new show arena in time for the 2020 fair. A bucket was passed around at the Wayne County Fair, where exhibitors and other fairgoers pitched in some money to help with the Richland County project, as well. It’s not clear how much Wayne County raised for Richland County, but the camaraderie and support was greatly appreciated. “It just couldn’t be a nicer situation,” said Villard Overocker.